Susan, Owen, Ruben and Cat planting new Avocados, 2013. I have a great family(wonderful grandchildren). They all help out at the ranch and love it as I do. We are lucky to have passionate staff to stand alongside. I love the central coast and all the possibilities. I love that the ocean is just over the hill. Some days I can smell the sea..and zip down for a coastal run, kayak, or boogie board. Mostly I love this land and feel honored to have spent my life nurturing it. What a life. My husband Roger and I have been lucky enough to live our dream and raise our family here. Although he has passed we feel his presence everywhere! How did we get started in the Vacation Rental business? Our family had been living on Cottontail Creek Road on the Magetti Ranch since 1977. In 1999 when the adjoining property came on the market. We wanted to expand agriculturally which we immediately did by adding more avocados, more cattle and oranges to the ranch. That left the question, what do we do with this extraordinary Cottontail Creek Ranch home built in 1978? Our goal is sustainability and the vacation rental does that as well as fulfills the home's destiny by entertaining tourists from around the world. The house truly combines luxury and homeyness while the views beckon you outdoors. 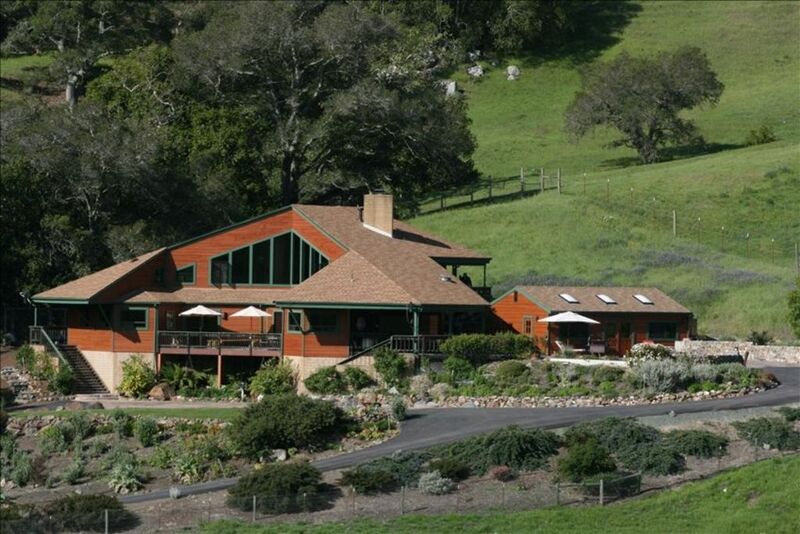 We feel that Cottontail Creek Ranch is the perfect location for sharing this part of old California with others. The byproduct of this has been meeting wonderful people while connecting them to the land. 'So much to Do or NOT, Close to everything the Central Coast has to offer' is what I tell potential guests. If you choose to venture out and leave the ranch the first wine tasting room is 15 minutes away and the beach is 12 minutes the opposite direction. The climate is moderate with a marine influence without a lot of fog and the extreme heat of inland, ' JUST RIGHT'! Staying at the ranch can be restful and quiet or full of activity, your choice. The location of our home makes it easy for our guests to enjoy the great outdoors without leaving the house, the patios and porches. You can also fill your days with hiking, walking and biking the property then take off for some wine tasting and beach activities or drive to Hearst Castle for a tour and the Big Sur Coast. We share any fruit and vegetables that are ready for harvest. We normally have oranges, lemons and limes all year long. Seasonally we have avocados, herbs and artichokes from the edible landscaping. It is a great to live off the land. Rolling Hills and Pristine Coastal Valley 14 minutes from Highway One and the beach. Double over sized convection and reg. 20 yd 2 lane lap pool with spa and kid's baja step. Daytime use only. Heated upon request at guest expense of the propane. Living room has large High definition flat screen television with Surround Sound Stereo, Satellite networking, Den, TV/VCR/DVD satellite networking, Master Bedrm#1 Flat screen plasma TV/dvd/ satellite networking, Fully Equipped Kitchen, 5 burner cook top, dbl, electric ovens, Microwave/convection, Blenders, Coffee grinders, Double coffee pots Separate Bar, Linens &towels provided plus Spa Towels, Oakwood BBQ & Fire Pit, (wood provided), Detached Multipurpose Room/fitness area with weights and yoga mats, ping pong or conference room, Cleaning service, Child Care, Massage Therapy, Chef and Personal Trainer available upon request for additional charge, complete amenities page on cottontailcreek website/Pool house at pool has elliptical workout machine. Across from the pool is the new tennis court and basketball hoop.